Behind the striking red brick facade that Sir George Gilbert Scott fashioned for the Midland Grand is a 5-star hotel, with a spa, pool, and a restaurant run by Marcus Wareing's team. A triumph of neo-Gothic splendour next to London's gateway to Europe. A triumph of neo-Gothic splendour, the striking façade of St. Pancras Renaissance London Hotel, designed by Sir George Gilbert Scott for the Midland Grand built between 1868 and 1876, has been painstakingly restored by architect Geoff Mann who worked with English Heritage to preserve as many of the original features as possible. Restored and reopened in 2011, the five star hotel contains 244 bedrooms, two restaurants, including The Gilbert Scott, run by Marcus Wareing's team, bars, a spa offering 6 treatment rooms, gym and pool, a ballroom, 20 meeting and function rooms, and 67 private apartments and penthouses. 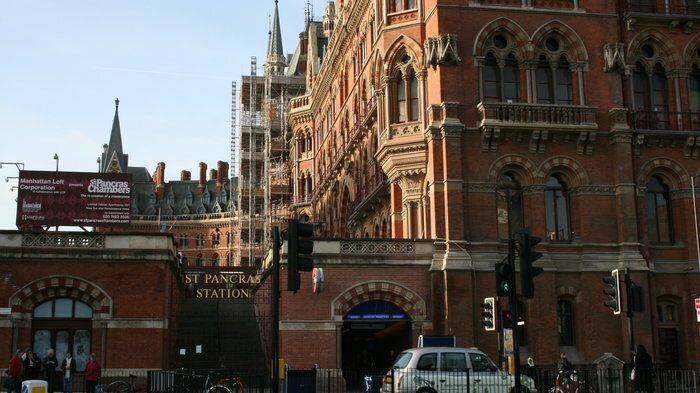 And all next door to St Pancras International, the London station for the Eurostar and gateway to Europe. The Gilbert Scott restaurant is situated in a stunning room with polished limestone pillars. Named in honour of the Midland Hotel's original architect, The Gilbert Scott is run by Marcus Wareing, serving traditional British cuisine. Located at the stunning St Pancras Renaissance Hotel London with amazing interiors by the renowned David Collins (are there any grand restaurants in London not designed by Mr. Collins? ), it opened in 2011 to great fanfare and has since become a destination in itself in the ever less grotty King's Cross area. Ideal as the end to a cultural evening following a performance at nearby Kings Place, there is also a private room and a bar to explore in this fantastically restored property. The restaurant resides in what used to be the ticket office of St Pancras Station. Located within the St. Pancras Renaissance Hotel, in what used to be the ticket office of St Pancras Station, The Booking Office takes its inspiration from the days when the hotel first opened with punches and drinks recreated from the Victorian era and served in handmade copper punch bowls. Opened in 1873, the Midland Grand Hotel, as it was originally called, launched at the height of a mixed drink explosion. Alongside revived Victorian cocktails and punches are ales by Meantime beers which arrive in pewter tankards. Open for breakfast, lunch and dinner, the Booking Office's all day menu offers a range of daily specials from braised beef cheeks to Lancashire hot pot. But most striking of all are the dramatically high ceilings of George Gilbert Scott's interior, updated with the addition of a 29 metre-long bar and modern sofas and armchairs. Guardian writer Sally Shalam was impressed by the ornate brickwork and arched windows describing it as, "surely the most inspiring new public space in London". And, if you head up to the platform level bar, you can enjoy al fresco dining while watching the Eurostar come and go. The 12-metre pool is housed within an elegantly Victorian tiled room. The spa within the elegant St Pancras Renaissance building has six treatment rooms, steam and sauna, a gym and a 12-metre pool housed within an elegantly tiled room. Ideal for relaxing, rather than doing lengths, the swimming pool leads to a Jacuzzi and is surrounded by poolside loungers, creating a relaxing spa atmosphere. If you are visiting with children, it's worth noting that there are set times when children can swim. The gym has a good selection of up to the minute Technogym equipment to work out on, cardio and strength training machines, free weights, fitness balls for core strength training and if you want to try something else, there are Power Plates in the gym to work you out with minimal effort. From cheap budget hotels to luxury 5 star suites see our special offers for hotels, including Club Quarters Lincoln's Inn Fields from 56% off.